Zainie (third left), Yeo (4th left), Charles (second left), Muthu (second right), Norman (right) and Sabah Wetlands Conservation Society vice president Dr Rahimatsah Amat (left) at the symposium yesterday. KOTA KINABALU: Good projects, such as mangrove and wetlands conservation, need funding. 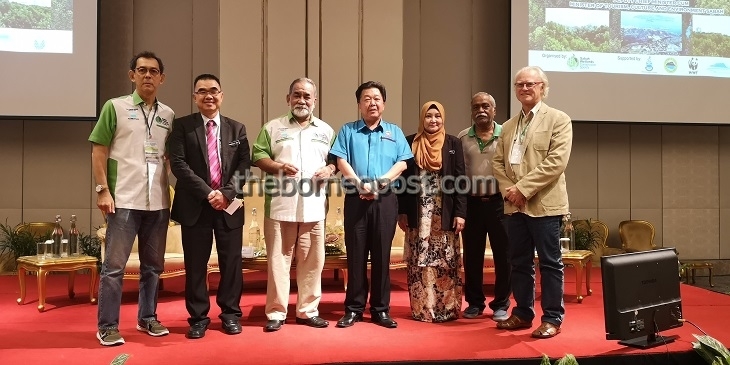 Sabah Wetlands Conservation Society (SWCS) president, Datuk Zainie Abdul Aucasa yesterday said without funding, all the good ideas and efforts to combat issues confronting mangrove and wetlands conservation would come to nothing. He spoke of the Payment Eco Systems (PES), which he said should be explored so that conservation efforts did not have to rely on donations and handouts all the time for funding. “There is an urgency to work out the PES,” he said. City Hall Mayor Datuk Yeo Boon Hai shared his opinion citing the importance of having enough funding to preserve and protect the wetlands. He added that the duty to preserve the wetlands in Sabah should not fall merely on the shoulder of the government but for all parties. A senior scientist at TropWATER, Australia, Professor Norman Duke stressed the importance of preserving what remains of wetlands everywhere, including in Sabah. He explained that there is a decline in wetlands in every country. However, he was optimistic with the strong interest shown to preserve the wetlands at the International Symposium on Conservation and Management of Wetlands, a two-day event which ended yesterday. A representative from the Drainage and Irrigation Department, Charles Yeo explained the tremendous benefits of the wetlands and stressed the importance of ensuring the public knew about them. He added that the KK Wetlands, for example, is being used for water treatment. “The wetlands neutralise the nutrients and pollutants before the water flows into the sea,” he said. Due to the wetlands, people are able to enjoy their activities at the beach, he said. He also reminded that it is cheaper to use the wetlands as a device to maintain the health of the ecosystem rather than deploying heavy and expensive machinery that requires high and expensive maintenance. He also proposed that value be added to Sabah’s wetlands as this will stop people to think of them as wastelands. Malaysian Nature Society (MNS) spokesperson, SM Muthu shared that he used to view wetlands as wasted land, but have come to realise that it is a source of life. He also said awareness continued to be an important issue when it came to preserving the environment.